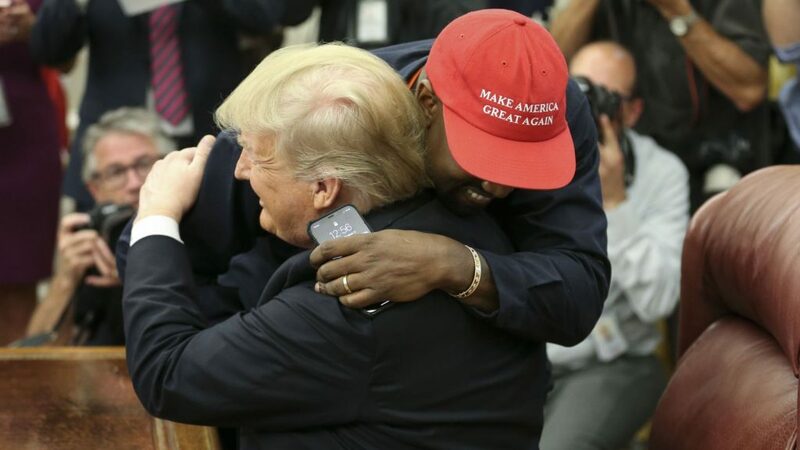 Meeting the president in front of reporters and photographers in the Oval Office, the superstar rapper gave Mr Trump little chance to speak as he made a wide-ranging, off-the-cuff address. He sported a “Make America Great Again” hat – popularised during the president’s campaign in 2016 – and revealed that his friends had tried to scare him into not wearing it. Saying how he looked up to Mr Trump, he hugged the president and said: “I love this guy,” describing him as a “master of industry” and a “builder”. He also proposed that Mr Trump get rid of Air Force One and purchase a hydrogen-powered aeroplane. Turning to the economy, West said employment was a major priority. “It’s more important than any specific deal – anything – that we bring jobs into America,” he said. West and Mr Trump were set to discuss a range of issues during his White House visit, including manufacturing, prison reform, preventing gang crime and reducing violence in Chicago – where the A-lister grew up. The music mogul also took the president to task over “stop-and-frisk” policing, where large numbers of people are temporarily detained, questioned and sometimes searched for drugs and weapons. Despite being deemed unconstitutional because of its impact on minorities, Mr Trump has previously said “stop-and-frisk works” and urged Chicago to adopt the strategy. After West warned “stop-and-frisk does not help relationships in the city”, the president said he would be willing to “look at it”.